People have told me pregnancy is a beautiful journey. But I would beg to modify. In my opinion, pregnancy is an experience – a million moments of life that every woman should savour; while Motherhood is a journey – a journey that takes you through the very many moods, aspects, virtues and emotions of life!! Motherhood has been my biggest tutor and a catalyst. Patience, Sacrifice, Tolerance and the remaining N number of virtues that I had studied in my moral science classes permeated through me only after Vihaan bloomed into my womb. I read a lot of concerns about weight-related attributes and felt the need to reassure you all as obsession is quite a mood spoiler. After going through 10 exciting, nervous and active months of pregnancy, I delivered Vihaan, the normal way, grabbing shots of epidural to ease I had piled on 10 kgs in the process. I never feared nor thought much about the post-delivery issues that is bound to engulf every woman. Well I was no exception, being a motherless child, I had no female aide to brief me about the physical disturbances, I was totally oblivious to the hormonal and body changes that were playing up. Post-partum depression hit me at its peak! But I endured, I realized the fact that this too shall pass. I was on my feet from day 2 after my discharge from maternity clinic. The first month blues played up on active mode. Vihaan barely slept and he never understood the concept of night like any newborn. My sleep would barely last for 4 hours, I only wished I had my mother beside me at this time! But, fortunately, days only got better and I started to feel the connection with Vihaan. My husband was a pillar for me. Both of us defined each other’s role in Vihaan’s life at this point in time. We complemented and supported tasks to ensure the 3 of us were pulling it off, enjoying the joys of parenthood and babyhood respectively. 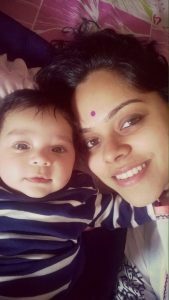 I attended to Vihaan’s needs by myself from day 1 – from giving his bath massages diaper change and the allied, for I firmly believed in the fact that only the mother will do her best for her child. It was my way of connecting with my offspring. No doubt I was very scared and skeptical, but practice fighting your fears. Vihaan went through his share of physical disturbances and I never let any unsolicited advises take its course. I purely operated on good pediatrician advice. Vihaan has completed 8 months and I still weigh the same minus his birth-weight of 2.5 kgs. My weight disturbs me at times when I think too much through it. But when I realize that I produced a LIVE BABY and I definitely owe myself a 6 inch fat around me – makes me forget all my woes. Also I HAVE tried all the strict weight loss plans but having to manage my house, my son, my husband and myself single-handedly, u surely can’t survive on the 4 meal plans that endorses weight loss – for you end up going tired and start looking out for the next edible food item that u can feed yourself! For someone like me who would bring the roof down if my hunger pangs weren’t fed, to be able to invest even two hours into my son’s meal time to feed him thoroughly is definitely a miraculous change. Not minding my eyelids fighting to sleep only to ensure Vihaan is drifting to deep sleep is definitely a sign of acquired Patience in me. My hands wanting to cook a variety of healthy nutritious and complete meals for him not minding my fatigue is definitely a sign of tolerance in me. I have always seen myself busy in the whirlwind of corporate life, I have always dreamt to be on the top rung of the corporate ladder. I was working with a top notch IT firm in Chennai and moved to Gurgaon 3 years back post marriage. I found myself a lucrative and fruitful position in an educational consultancy. Life was good and one day I had to drop all of that – my dreams, my ambition, my fat pay cheque, etc., as Vihaan firmly demanded I give him all my time in order for him to be good friends with me. It was a tough call, a tough choice I had to make at this point in life when I had already invested 4 years into my goals. BUT thinking about it, life is complete now it’s all in the mental make up if a person. I made sure I justified my absence from career by investing in the holistic development of my son. Nothing could actually matter to me more than my son trying to connect with me every second through his babbles, gestures, squishes and his not-so-often hugs. Over the last few months, I have come to learn to stay proud & content of the choices I have made. So all you mommies, you guys have done the impossible! You all definitely need the world praising for a lifetime! Stop worrying about the weight -it will eventually shrink out – eat right – eat well! Pregnancy is normal, post-pregnancy is even more normal. Listen to your heart, do what’s best for you and what’s right for you. Never give up, fight the pre & post delivery blues in your style! Remember everybody is different – it’s going to be a great journey for each one – live the moment! Never sympathise yourself – love yourself to infinity , the rest will fall in place. The New Moms Club is home to thousands of moms. Click here to join the club.